Having a prevention strategy when dealing with cluster migraine symptoms is important. With 10 out of 10 pain you need a plan! Let me start by saying that the correct classification is Cluster Headache. And here are some things you need to know in order to survive this violent, unbearable condition. 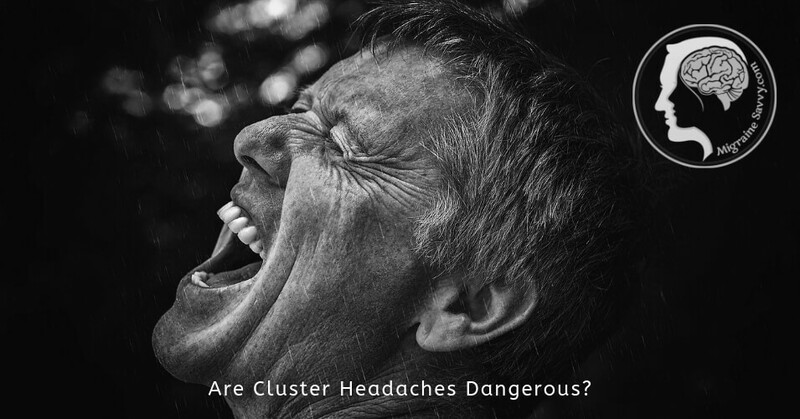 Despite the intense pain of cluster headaches, they are not life threatening. Cluster headaches may not be life threatening but they can be very harmful to your quality of life. Without proper treatment you might experience depression and/or anxiety disorders, and some of the symptoms are violent. Cluster headache attacks are normally shorter than migraine attacks. They typically last between 15 minutes to 3 hours and occur at predictable times. They occur in clusters, thus the name. Clusters meaning a cyclic pattern. The average number of attacks is twice a day. The most common time is in the very early morning between midnight and 3 am, and then once again later in the day or early evening. Or there can be a one every other day, or rarely, they can recur up to eight times a day. Cluster headaches are known to be one of the most painful types of all the categories of headaches. 10 out of 10 on the pain scale! It is really important to avoid all your known triggers as one way to potentially reduce your symptoms. It may take some time to learn them all. Triggers can be tricky. For ways to treat cluster headaches - click here. The good news is that these cluster headaches are not life-threatening and there is current treatment (in most cases) to make the attacks shorter and less severe. Effective medication is available for cluster migraine symptoms. The gammaCore (electroCore LLC) is the first hand-held device proven to help with cluster migraine symptoms. This device won’t have the side effects or dose limitations like medications, it's considered low risk. Click here to read more about how to use it. The bad news is that these headaches usually wake you in the middle of the night with really severe pain in, above, below or around one eye, along your temple or on one side of your head. This may not give your medication enough time to start working, depending on what you are taking. Swelling on one side of the face, like your worse sinus attack, can be common. Typically cluster headaches last from weeks to even months, but can then be followed by a period of remission. These remissions can last for months and, at times, even years. 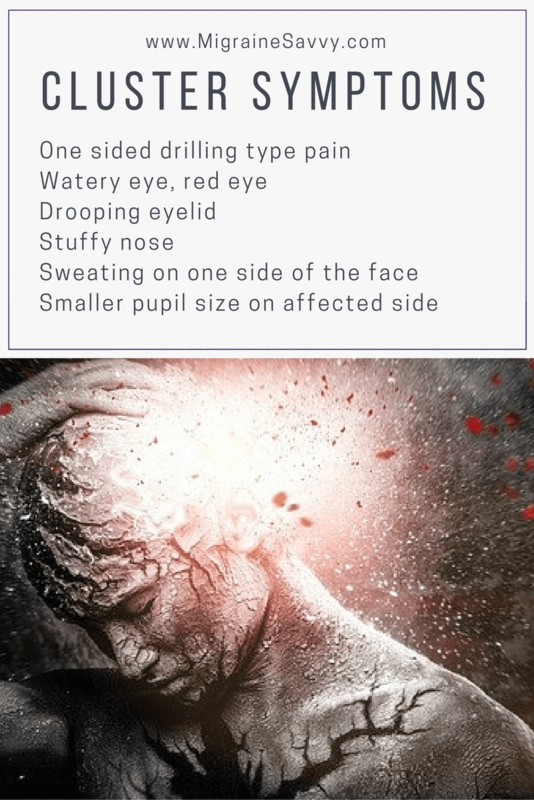 These cluster migraine symptoms all occur on the same side of the head as the intense, stabbing pain, usually behind one eye or at the temple near the forehead. Cluster headaches usually start at the same time every night, or every day. They are predictable in this way... even if you are episodic. You know the pain phase is coming and you can often count the minutes it will last. Many times there is no warning before the pain phase hits. Dealing with cluster migraine symptoms leading up to the pain phase is most distressing. 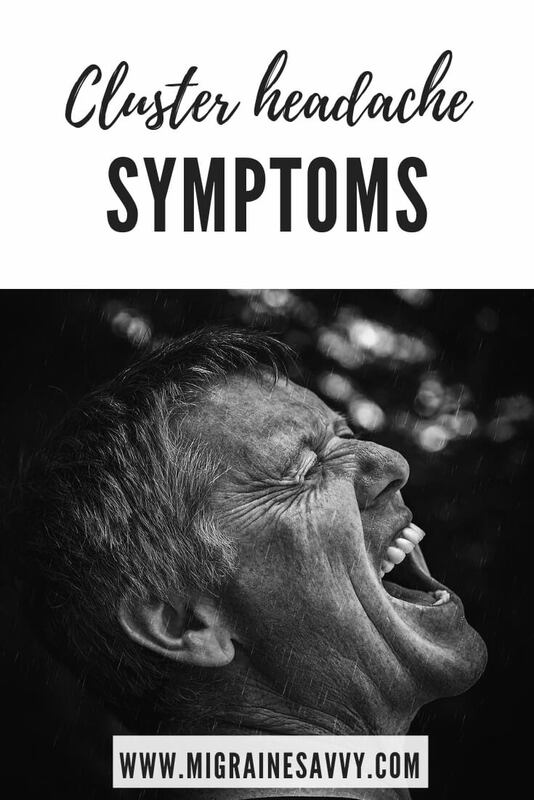 Read this PDF from Dr. Peter Goadsby on the Treatment of Cluster Headache (AHS), print it out and take it with you to your next physician's appointment to help find the best medication possible. Cluster headaches are a long, difficult journey. It may be hard to determine your trigger or triggers, and they are severely painful. If you are reading this page, then I suspect you already know this. 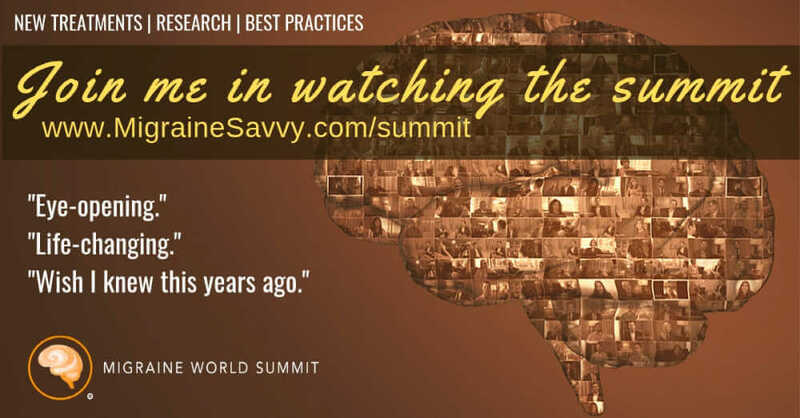 Please consider developing a migraine prevention pain management strategy with your doctor, so you can have the best life possible despite this condition. Here are some other things that will be helpful to do. Now this is going to sound hard to do... but... record your attack to show your specialist. You can play it back – s/he will see the agitation, the tearing and drooping eye, the runny nose, the face flushing and sweating. If s/he sees this video on your phone, s/he should be able to diagnose you much quicker. Do I Have Cluster Headache? If this sounds impossible, keep a log of events that surround the attacks. You can record things you think might be a trigger for your cluster migraine symptoms. Once you have figured out what typically triggers them, avoid them at all costs if possible. You can keep a manual diary recording: duration, frequency and your other symptoms that will help you and your doctor see patterns, potential triggers, and plan more effectively for your treatment strategy. Part of the prevention strategy may include the avoidance of alcohol and nicotine, which often appear to be triggers for cluster headaches. The consumption of alcohol, including wine and beer, can trigger a headache if you are in a cluster period. People have tried other sources of pain relief such as acupuncture, acupressure, chiropractic, and even homeopathy, but over the years is it thought that less than 10 percent of these therapies have been effective to relieve cluster headache episodes. Some of the natural medicines may be worth a try. Melatonin (9 mgs) has shown to have a modest effect in the treating of cluster headaches. Take it at night to improve your sleep and hopefully prevent attacks at the same time. Population studies with low levels of vitamin D have been linked with cluster headache. There's no evidence based medical research but if your attacks reduce in intensity then the blood test will be worth it. Make sure your doctor measures serum calcium at the same time. S/he will have to watch for vitamin D toxicity too, so make sure to work with your doc on this. Typical maximum safe dose per day is 4,000 units, but you might need (patients in the community normally use high dose) 10,000 units per day. After that your vitamin D level will be high but that’s where you want to be. There's also some anecdotal evidence for using kudzu which was shown to help reduce the intensity, duration, and frequency of the headaches, but did not decrease the length of the headache. Safe and worth a try! If you are living with chronic or episodic cluster migraine headaches, you might find they effect every aspect of your life. You might find them unbearable and frightening, and have suicidal thoughts. That comes with this condition. Your life can be affected because of decreased interaction with your friends and family. They may affect your ability to work full time. People without cluster headaches may not understand how painful the attacks are and how much they can actually effect the overall quality of your life. Being isolated and misunderstood can lead to depression and suicide. You are at greater risk as violent behavior and the propensity to self-harm are cluster migraine symptoms. 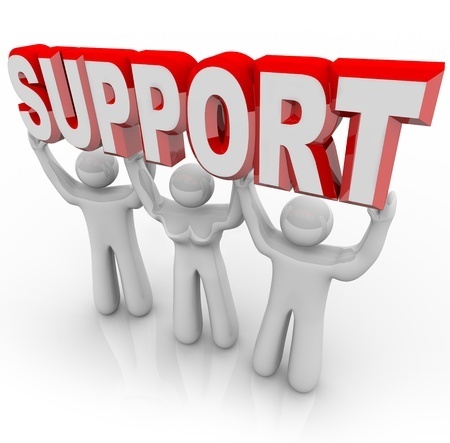 You may find encouragement and understanding in a headache support group or you may feel the need to talk with a professional pain counselor or therapist. Here's who I recommend - Pain Counseling. Either of these can help you to cope with the cluster migraine symptoms. There is a VERY good chance that the others in the group will be experiencing the same things as you are. The exact cause of cluster headaches is unknown, so it's hard to prevent the occurrence. It's very important to have a preventive strategy because only treating the symptoms with medications can, at times, seem hopeless. OUCH UK has a help line and they maintain an information list of practicing neurologists with a practicing headache specialist. They can point you in the right direction. Clusterbusters.org in the US has a wealth of information for you to stay up to date on treatments and research.